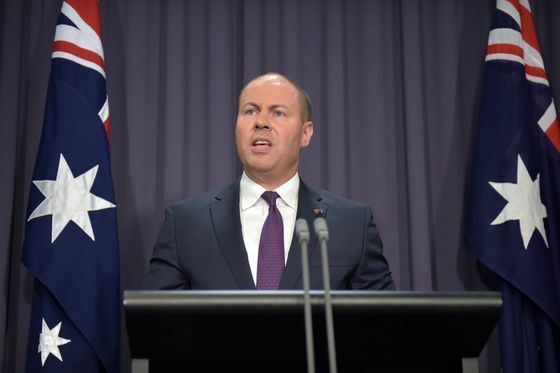 Australia is poised to bring to a close its longest stretch in the red since at least 1970 when Treasurer Josh Frydenberg hands down his budget to parliament in Canberra Tuesday evening. The underlying cash balance will record a surplus of A$4.6 billion ($3.3 billion), about 0.2 percent of gross domestic product, in the year through June 2020, according to the median estimate of economists surveyed by Bloomberg. That would be the first time the books have been in the black since fiscal 2008, just before the global financial crisis hit. Australia’s fiscal position hasn’t been assisted by leadership instability on both sides of politics, with six prime ministers between 2010 and 2018, making it difficult to boost tax revenue or cut spending deeply. It’s likely to have another new prime minister in May, when an election is due to be held with Bill Shorten’s Labor opposition consistently leading in opinion polls. The budget turnaround -- a little over two years ago Australia faced ejection from the small group of nations that carry the top rating from all three major agencies -- has been rapid, reflecting a rebound in commodity prices and strong pickup in employment. The jobless rate is now 4.9 percent, an eight-year low and down from 6 percent at the start of 2016. Budget revenue has continued to gush even as tumbling house prices see consumers rein in spending, driving a slowdown in economic growth. Australia expanded at an annualized 1 percent in the second half of last year, down from almost 4 percent in the first six months. Economists predicted the budget will show net debt as a percentage of GDP at 17 percent.